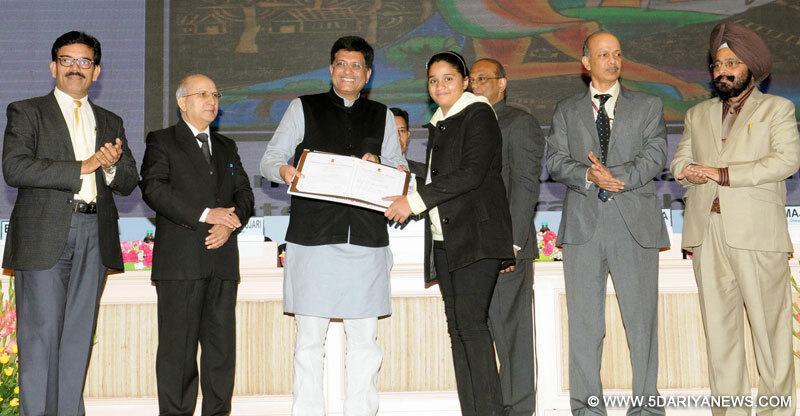 Piyush Goyal presented the National Painting Competition Prizes, at the National Energy Conservation Day function, in New Delhi on December 14, 2015. The Secretary, Ministry of Power, Shri P.K. Pujari and other dignitaries are also seen. Piyush Goyal, Union Minister of State (IC) for Power, Coal and New & Renewable Energy said “this is the time each and every one of us takes it upon ourselves and pledge to the world in a mission mode to strengthen and redouble our efforts to become a more conscious country. Each one of us has to decide their contribution in saving the climate and in my mind; I do not doubt the fact that India will fulfill its INDC commitments. It’s the only way successfully leaving behind for the next generation a cleaner planet, healthier future, a more prosperous nation to live in. I am sure I will keep on getting your support in making India a more energy secure nation in future.” Shri Goyal said this while speaking at National Energy Conservation Day function here today. The Minister also launched ‘Star Rating’ mobile app on the occasion. This app is linked to the Standards and Labeling database and provides the user a platform to compare personalized energy saving devices across the same class and get a real-time feedback from consumers and other stakeholders so they can make an informed purchase decision. Apart from being a one-stop solution for customers, it’s also a valuable tool for policymakers to access the accumulated data and analyse the feedback of the market at any given point in time. The app can be downloaded from the play store of any android and iOS operated smart phones. Shri Piyush Goyal distributed the prizes to industries, commercial buildings, railways and establishments to recognize their efforts towards adoption of energy efficient technologies and practices in their units who made the cut in adopting energy efficient practices, thereby reducing wastage and costs. Along with presenting the awards to the energy performers, Shri Goyal also gave away the prizes to the first three position holders of the painting competition that was held at the school, state and national level. Elated with the children’s artworks, Shri Piyush Goyal congratulated the winners saying, “It’s inspiring to see that our efforts towards energy conservation are having a tangible impact on these young minds. Their imaginative paintings are proof that they are concerned about climate change and determined to make a difference. What better way than for them to lead the process of change and create growing awareness for our scarce natural resources”. Various industries including drugs and pharma, cement, BPOs, offices, universities, automobile manufacturing, hospitals, consumer goods, dairy, electricity distribution companies, fertilizers, petrochemicals, zonal railways, malls, soaps and detergents, textiles, thermal power stations, Financial Institutions, ESCOs, DISCOMs and many more participated in the Award function this year. The event was organized by Bureau of Energy Efficiency (BEE) as a part of National Energy Conservation Day celebrations. Union Power Secretary, Shri P K Pujari in his welcome address congratulated the Award Winners for their innovative steps to conserve energy. He said that that efficient use of energy resources and their conservation assumes tremendous significance for the economy today. The function was attended by Additional Secretaries , Ministry of Power Shri B.P .Pandey , Shri B.N. Sharma , Shri Major Singh , Chairman C.E.A and Dr. Ajay Mathur, Director General, Bureau of Energy Efficiency apart from the officers of various Ministries and CPSUs .